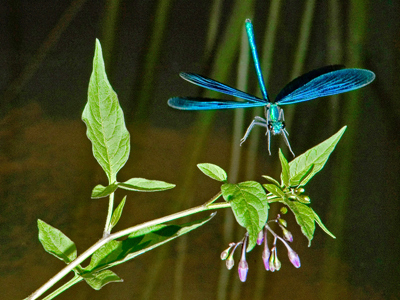 I've always loved bugs, but only recently became intimately acquainted with damselflies, those slow but beautiful cousins of the better-known and aeronautically more talented dragonflies. 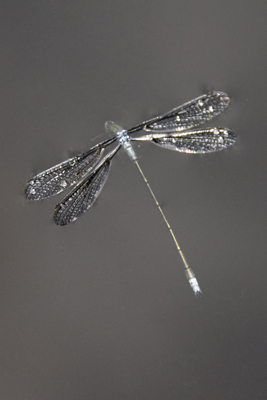 The guys in these pictures were found in early July on a stream in Hågadalen, on the west side of Uppsala, Sweden. 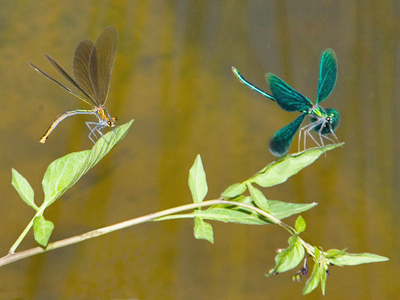 The females are brownish, and the males are blue. 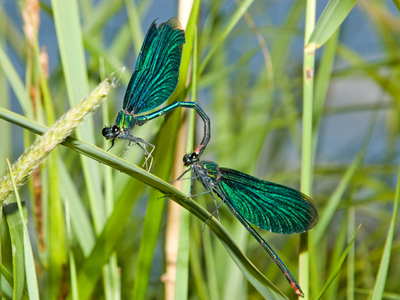 Those with completely blue wings are Beautiful Demoiselles (Calopteryx virgo), and those that are only partly coloured are Banded Demoiselles (Calopteryx splendens). 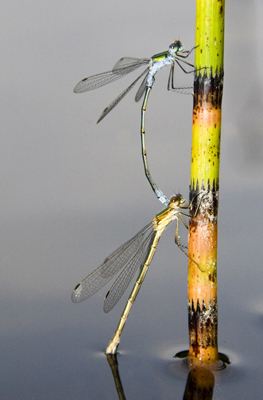 In the pictures above you see a couple dating and then mating, which is a complicated procedure. 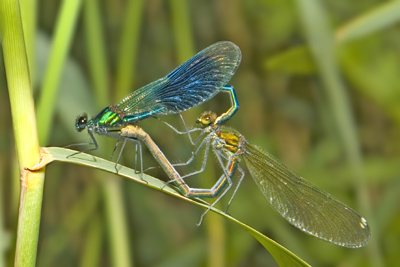 First the male has to demonstrate his attractiveness by showing that he's tough enough to defend his territory from other males, which takes up most of his working day. Then when he thinks he might get lucky he has to move his sperm to a depository at the front end of his abdomen so that the female can reach it. Having approached his lady he cuddles her neck with the claspers at the end of his abdomen, and if she's in the mood, she bends her abdomen around to pick up his sperm, thus ending up in the contortion in the second picture. 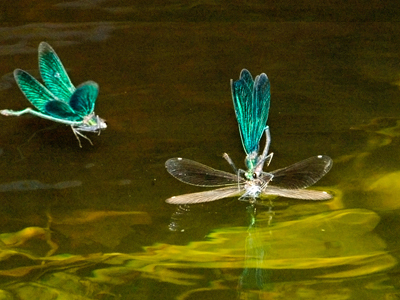 If disturbed, they can even fly whilst coupled like this. 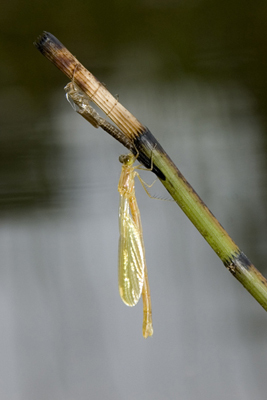 After the naughtiness is over, the female wants to lay her eggs underwater, and on the way there she will often be molested by other males, but her most recent boyfriend will hang around and try to defend her honour. 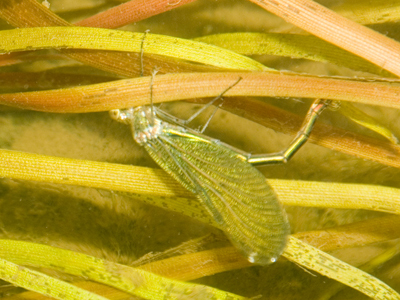 When she gets underwater, she will lay several hundred eggs by injecting them individually into the stalk of a plant, where they will develop into larvae that will live underwater before emerging as adults, as captured in a great photo sequence by John Macken at http://www.sonic.net/~bigsnest/Pond/Lists/emergence.html. 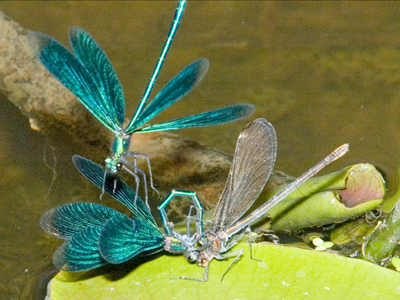 The second picture shows a male trying to mate with another male. 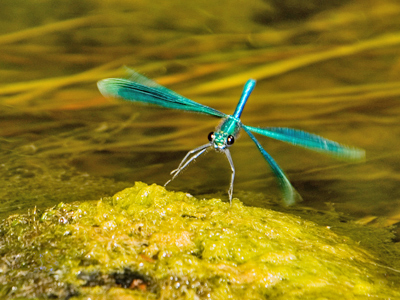 From his battered condition it looks like he's tried it on the wrong guys a few times, but then it can't be easy to be secure in your masculinity when you're called a Beautiful Demoiselle. 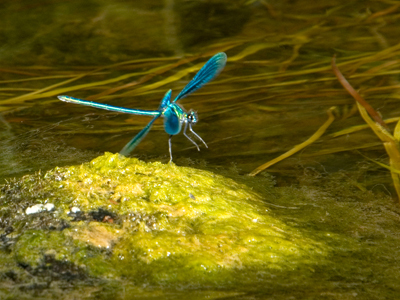 And then it's time to get back to defending some territory and showing off flying skills to impress more girls. All the 2005 pictures were taken using flash with a Nikon D70 and a Tamron 28-300 zoom set at around 200mm and f11-f20. Click on the pictures for a bigger version. 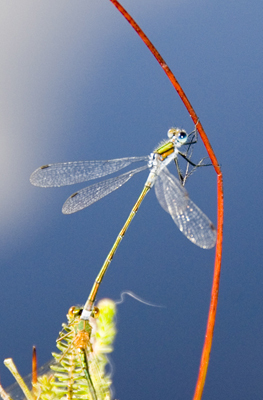 There are more than half a million other web pages that deal with the odonata, and you can head out towards more scientific ones by starting at Martin Peterson's Swedish dragonfly site.